Poor Sookie tries to escape from someone's grasp. That sure kind of looks like Steve Newlin to us, but either way it definitely doesn't look good. The beautiful Sarah Newline looks down from above in this upcoming episode of True Blood from season two. 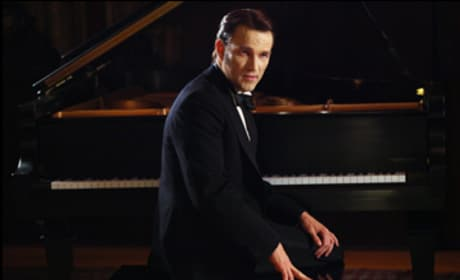 In this flashback from Bill's past in an upcoming episode of True Blood, Bill Compton sports a tuxedo and plays the piano. 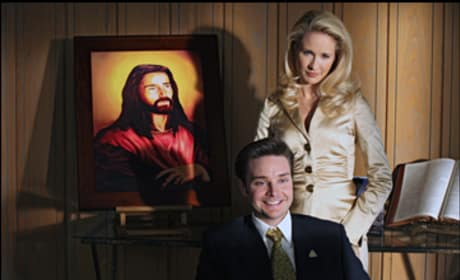 A lovely picture of Sarah and Steve Newlin... with a nice portrait of Jesus in the back. Steve has quite the ego to him.